Keyword: total freedom! 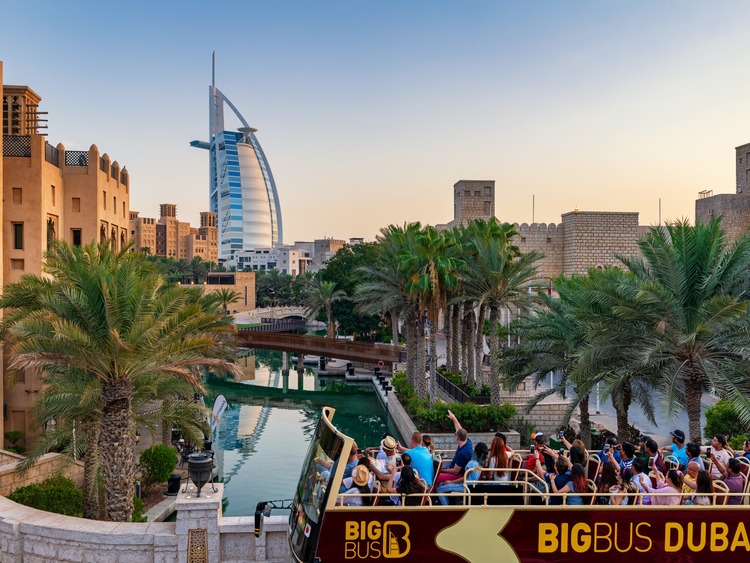 Amazing monuments, sophisticated shopping, museums of all kind, lively souks, exquisite restaurants or endless beaches: what is best in Dubai is within reach on this comfortable hop-on hop-off coach excursion. We get on a comfortable double-decker coach offering great views from the first-level windows as well as the thrill of feeling at one with the city on the open-top second level. There are over 38 stops with the “hop-on, hop-off” formula where we can get on and off as we please and choose what sights to see each time. Coaches on our itinerary pass at regular intervals of 10-20 minutes so we can hop back on whenever we want to continue on our discovery of Muscat. Three different routes are available: the Red City Tour lasts approximately 2 hours, the Green Beach Tour lasts 2 hours and 20 minutes and the Blue Marina Tour lasts 1 hour and 30 minutes. As we have the whole day available, we are truly spoilt for choice! While comfortably seated on the coach, we can listen to the interesting audioguides (available in 12 different languages) providing information on the monuments and sights that can be admired on the way. How can we resist the temptation of admiring the towering Burj Khalifa, the tallest sky-scraper in the world, or the luxurious Burj Al Arab, the famous 7-star hotel whose unique sail shape has turned it into a symbol of the city? No problem: all of Dubai’s gems are within easy reach on this tour! And getting back to the port is also not a problem: a return shuttle departs ever 30 minutes from stop no. 2 of the circuit. What more could we want? Headphones are available on the coach. The ticket is valid all day long and includes the three itineraries; the last departures are at 6 pm. Return to the cruise terminal with shuttle service from stop no. 2 (Dubai Mall) every 30 minutes. Free Wifi is available on all buses.